I woke up a bit later than usual, in a dim hotel room in San Luis Obispo, CA. I hitched a ride this weekend with four ex-coworkers; an international mix of men who flew in from London on business. I slowly got ready for the day and soaked up some morning sun by the hotel pool while I browsed Yelp for a place to sit and write; I was also craving fresh juice. I discovered a spot called “Bliss Cafe” and called a Lyft. I ordered a Cucumber Cooler (cucumber, mint, apple, and lemon) and found a shady table on the patio overlooking a creek overflowing trees and greens. Bliss is a fitting name. Just as I began writing, the place started to buzz. “The Mayor is coming!”, a sweet woman exclaimed as she brought me a sample of her home-made, vegan, mint-chip, “cheese” cake. 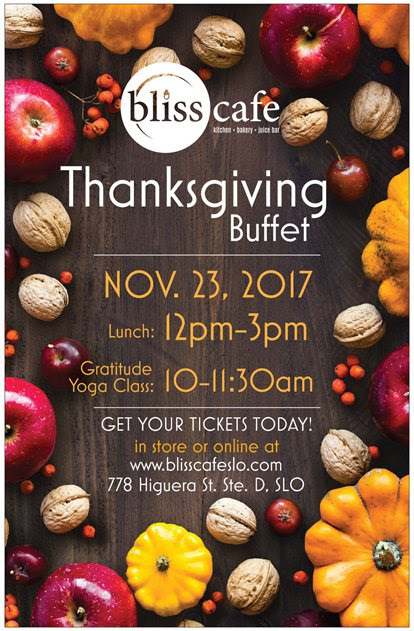 It turns out that Bliss Cafe is throwing a vegan Thanksgiving feast and they invited the Mayor of San Luis Obispo to come and try the menu! 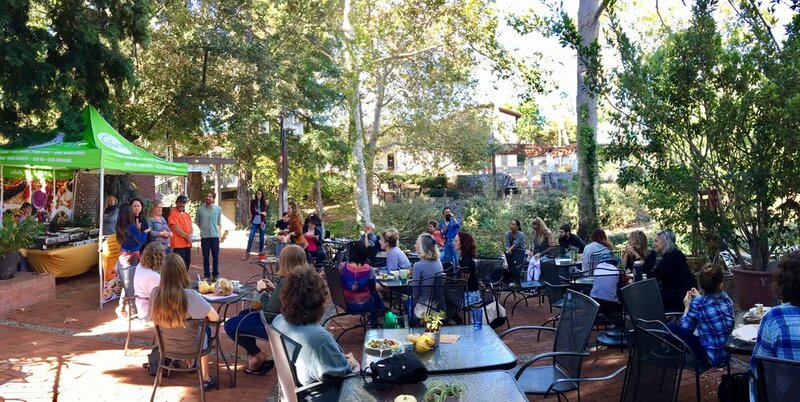 The new, female, Mayor of San Luis Obispo, Heidi Harmon, has partnered with local organization SLOVegan and is participating in Meatless Monday as an action to battle climate change. I couldn’t help but laugh; Of course I would randomly end up at this event. I planned the impromptu trip to SLO when I found out days earlier that my best friend would be in town from London. Ever since I’ve become vegan my intuition as gotten clearer, and this was more evidence. I listened to the voice that told me to make the last minute trip, as well as the pull towards this particular cafe today. 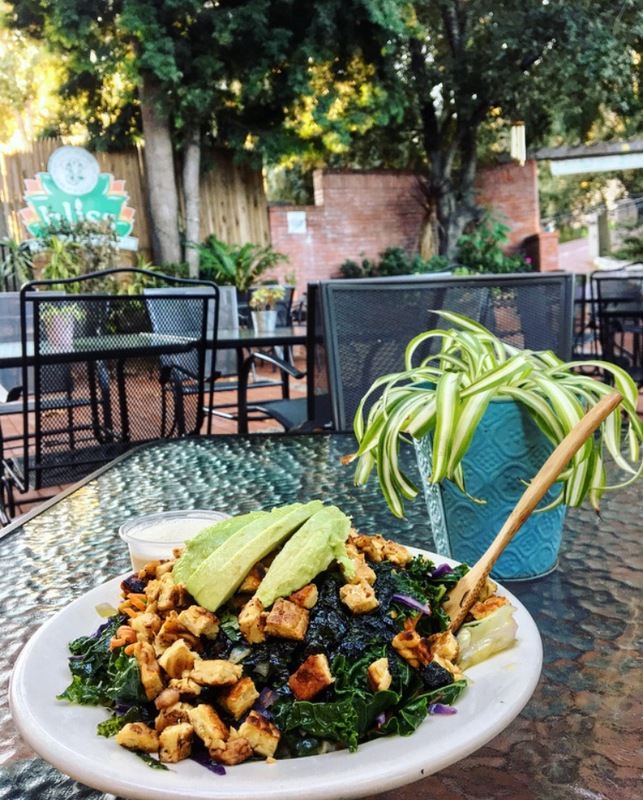 Bliss Cafe’s gorgeous back garden patio filled quickly with excited, friendly faces, eager to try this untraditional Thanksgiving meal on this beautiful Monday afternoon. The tone of the event was filled with community, enthusiasm, and curiosity. Everyone, including me, waited patiently in line to receive a full plate of vegan goodness. We were greeted at the buffet by the two restaurant owners, David Fintel and Palaka Sauer, who were flashing genuine smiles of passion and pride. They were serving up rice, curried vegetables, breaded eggplant "parmesan", cranberry chutney, sweet potato soup, pumpkin cheesecake with coconut cream, and some more delicious vegetable concoctions, which was only a small sample of what they will be serving at their feast on Thanksgiving Day (See the event page!). Once everyone was settled-in enjoying their samples, a panel of hosts began speaking about the vegan movement and the event. The Mayor, Heidi Harmon, spoke first. She told the group that she is a passionate climate change activist, leading the city in making climate action a major goal for the first time in San Luis Obispo’s history. She participates in Meatless Monday, in which she saves 5,000+ gallons of water, and at least 30 pounds of grain per week. She made a specific point to say she is not 100% vegan, but she is moving towards that goal, so not to judge her if we see her out on the town eating cheese - we would never! She also spoke about her initiative which deters the use of single use plastics such as cups and straws! She demonstrated replacement items such as a glass straw, metal utensils, and a collapsable, reusable bowl that is easy to carry on the go. I could've cried. This is the MAYOR talking?? Heidi said there will be no plastic police or fines, but there will be a ban on the sale of single use plastic bottles in public places such as parks. She wants to gently encourage and enforce the culture change. I clenched my bamboo fork and glass straw, and resisted the strong urge to wave them in the air. I love this woman! Another local business owner, Rachael Hill, spoke about her company SloVeg, which delivers produce from nearby farms and also generously donated the produce for this event. Bliss Cafe owner Palaka Sauer added, in his infectious Brazilian accent, the importance of buying local and organic and to always remember to ask where your food is coming from. He thanked the community for attending and invited another activist, Peggy Koteen, to speak about her work. Peggy is an involved animal rights activist and a lovely woman who I got a chance to speak with earlier. She shared that the Happy Hen Animal Rescue Sanctuary will be hosting a fall feast for rescued farm animals in honor of Thanksgiving! The guests began to dwindle as I chatted enthusiastically with three gentlemen about plant-based living and the obstacles we face in our society. We unanimously agreed that the diet is easy; it is our culture that is the challenge. The four of us bantered back and forth about how much healthier and happier we are since going vegan, how empowering it is to know your body, the power of plants as medicine, how to raise children ethically, and so on. I feel validated in my career choice and ready to release my new eBook, “A Beginner’s Guide To Saving The Planet”. This knowledge is being sought after and I am grateful to deliver it. I am also more confident than ever about the launch of my Plant Based course that will be starting in early 2018! I’ve known that people are curious, but to talk to them in person and hear what they need is invaluable. I feel blissed, and blessed, to have found my way to exactly where I was supposed to be on this day, which happened to be 240 miles away from home. Life has a way of guiding us to people, places, and situations that can benefit and enlighten us if we let them. Yet in order to see the opportunities in front of us, or to feel the instincts inside of us, we must first make the connection between those two things; the world around us and ourselves, how we live and who we are. Plant-based living connects us to the earth that ultimately we are a part of, and to the community of people living in it just like us. Discover what makes you happy, make choices that align with your values and follow what makes you feel good. Follow your bliss!